Set amidst a quaint landscape along the banks of the Malaprabha River, Pattadakal a UNESCO World Heritage Site was the second capital of the Badami Chalukyans between the 7th and 8th centuries. Located in Bijapur district of Karnataka , Pattadakal was not only the capital of the Chalukyans, but the place where all coronations took place. The village Pattadakkal houses some of the finest monuments, sculptures and magnificent temples which represents the glory of the Early Chalukya achievement during the 7th and 8th centuries. Referred to as Petrigal in the Ist Century AD by Ptolemy (a great geographer), Pattadakal was known variously as Raktapura (Red Town) and Pattadakal Kisuvolal (means stone of coronation). This was once used as a ceremonial centre where kings were crowned and commemorated. Pattada means coronation of Kings and hence the place name Pattadakal. Stand in a landscaped compound entered at the northwest corner, most of the temples here were raised by the various Chalukya rulers. Built out of the pink-tinged gold sandstone, some are in the southern Draviday temple architecture of the Pallavas, while others have northern curvilinear towers. The sacred temple complex of Pattadakal consists of 10 major temples, each resplendent with beautifully textured carvings and pillars. Situated just inside the entrance , these twin temples are very small and now partly ruined. Both temple have curved spires decorated with horseshoe - shaped arches and ribbed elements. Thee shrine of the Jambulinga temple houses a figures of the Dancing Shiva (Natraja) next to Parvati and Nandi (Bull). The Kadasiddeshvara temple houses a sculpture of Shiva holding a Trishul (Trident) in his hands. Situated to the East is the Galaganatha Temple. Partly damaged, this temple is similar to Navabrahma temples in Alampur, Andhra Pradesh which were also built by the Chalukya dynasty. Built around A.D. 750, it's most striking features is the well - preserved curved tower, including horizontal tiers covered with horseshoe shaped decorations, ribbed elements are positioned at the ends and at the top. Porches once projected outwards on three sides, only that on the south survives. It also contain a relief of Lord Shiva killing the demon Andhakasura. River goddesses and a dancing shiva adorn the doorway of the sanctuary. 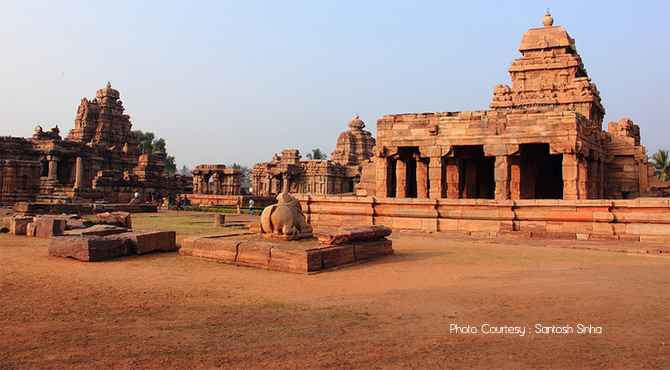 Dating from the reign of Chalukya Vijayaditya Satyasraya (AD 697-733), it is the oldest temple in Pattadakkal. Although it remains incomplete, Sangameshvara Temple has all the hallmarks of the Dravidian style architecture. The temple is of three storeys finely proportioned capped by the square to dome roof form. The moulded base with mythical animals, the wall symmetrically divided by pairs of pilasters flanking sculpture panels. Most of the sculpture panels are incomplete. It is the late 8th century temple dedicated to Lord Shiva. A north - Indian style, Kashivishvanatha Temple was probably the last to be built in the Early Chalukyan style at Pattadakal. The temple is the only example to be assigned to the Rashtrakuta period in the second half of the 8th century. The most striking feature of the temple is the wall projections which have pediments and arch-like motifs and similar designs cover the tower. A reduced and rectangular columned hall to the east is surmounted by a large horse-shoe arch. The interior of the pillared hall is richly sculpted, with scenes of Krishna. It is said in one of the inscriptions that these temples were erected by Trilokayamahadevi, wife of Vikramaditya II, to commemorate Vikramaditya's victory over the Pallavas at Kanchipuram. The Virupaksha, a Saivite temple has ling sanctuary surrounded by a passageway that opens on to a columned hall, divided into five aisles and entered through three porches. The temple also houses a black polished stone Shiv linga and a huge 2.6 m high chlorite stone Nandi at the entrance. The whole of the interior of this temple is richly carved with with modeled sculptures. Episodes from the Ramayana, Mahabharata and the Puranas are depicted on the pillars. Different forms of Vishnu and Shiva, including striking panels which show Shiva appearing out of a ling are richly carved in the 3 storeyed tower above the shrine. The temple boasts a beautiful carving designed to look like an elephant from one side and Nandi from the other. A slight differences between these two temples. It is another north Indian style temple in Pattadakkal with a long row structure with porch, hall, sanctum and has interesting sculpture on the ceiling and pillars. Two interconnecting columned hall lead to a sanctuary with blind porches on three sides. It's tower over the sanctuary is similar to the superstructures of the Kadasiddeshvara and Jambulinga Temples. The basement of the front porch of the temple is carved with struggling elephants and lions. The other famous temple in Pattadakkal is Mallikarjuna which has sculpture which consists sculptures from the Bhagavad Giral. Situated about 1 km from the village center is Jain Temple. Locally famous as Jaina Narayana, with its two stone elpehtnats is the last addition at Pattadakal which was made during the reign of Rashtrakuta ruler Krishna II of the 9th century A.D.
children up to 15 years free.